While I didn't read *every* essay in its entirety, the earlier writing interested me most - the writing from travelers, from botanists, from journal entries of rough-hewn prairie dwellers - the stuff about the settlement of the region of lakefront prairie and swamp that gradually was transformed into Chicago. I originally picked up this book because I saw an essay about pigeons, that dirty, infernal city-bird described to me early in my city years as "rats with wings." That essay turned out to be short and unremarkable. It was the early writings that showed me what existed once beneath this concrete jungle, adding to my understanding of the natural world that still peeks out of the corners once in a great while. Joel Greenberg - Joel Greenberg is a research associate of the Chicago Academy of Sciences Peggy Notebaert Nature Museum and the Field Museum. 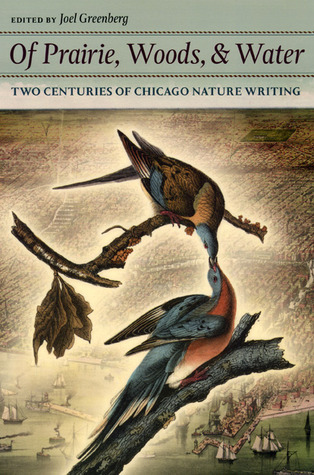 Author of three books, including A Natural History of the Chicago Region, Greenberg has taught natural history courses for the Morton Arboretum, Brookfield Zoo, and Chicago Botanic Garden. He helped spearhead Project Passenger Pigeon to focus attention on human-caused extinctions. Greenberg lives in Westmont, Illinois. Visit his blog at Birdzilla.